Brain aneurysm is a term which describes a bulge in the wall of a blood vessel which might soon rupture. 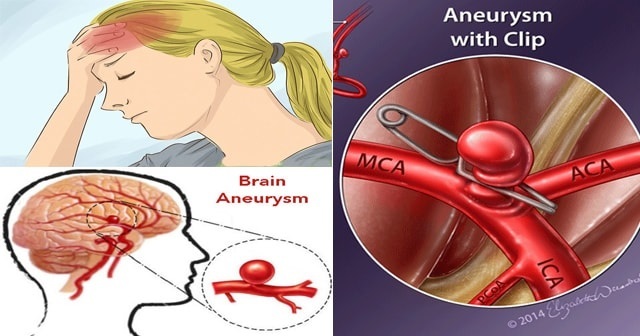 A ruptured aneurysm can lead to internal brain bleeding which is fatal in most number of cases. In general, the condition doesn’t manifest through a specific symptom, but there are quite a few symptoms which people often ignore. According to brain aneurysm patients, they experienced headaches, neck pain, blurred eyesight and defective speech before the event. Experts say that headaches are not uncommon in these cases, and that they may be accompanied by pain you’ve never experienced before. About 10% of brain aneurysm patients die instantly, while 50% die within a month, especially if they don’t receive proper medical care. Furthermore, the bleeding in the brain significantly increases the risk of a stroke in the coming months. High blood pressure, atherosclerosis, head trauma, genetics and poor blood circulation are considered the main culprits for brain aneurysm. Taking drugs such as cocaine can increase the risk of the condition, as the drug weakens the artery walls and raises the risk of several cardiovascular problems. Due to the severity of the condition, brain aneurysms are always treated with surgical procedures such as the ones you can see below. During coiling, a neurosurgeon inserts a tube in the arteries of the patient and locates the aneurysm, wrapping it in platinum wire coils. This will block the blood flow to the bulge and prevent any problems. Clipping an aneurysm requires opening up the patient’s skull and applying a clip over the bulge. This will cut off the blood supply in it and prevent further problems, significantly reducing the risk of stroke. In order to prevent a brain aneurysm, you should lead a healthy lifestyle and keep your blood pressure in check as well. You should also reduce your stress levels, avoid consuming too much salt and exercise regularly. Smoking, alcohol and drug abuse raise the risk of brain aneurysm tenfold, which is why you should stop these unhealthy habits before it becomes too late for you. Staying hydrated is pretty important as well, so make sure to drink lots of water. Consume heart-healthy foods and keep your weight in check, and the risk of a brain aneurysm will go down.